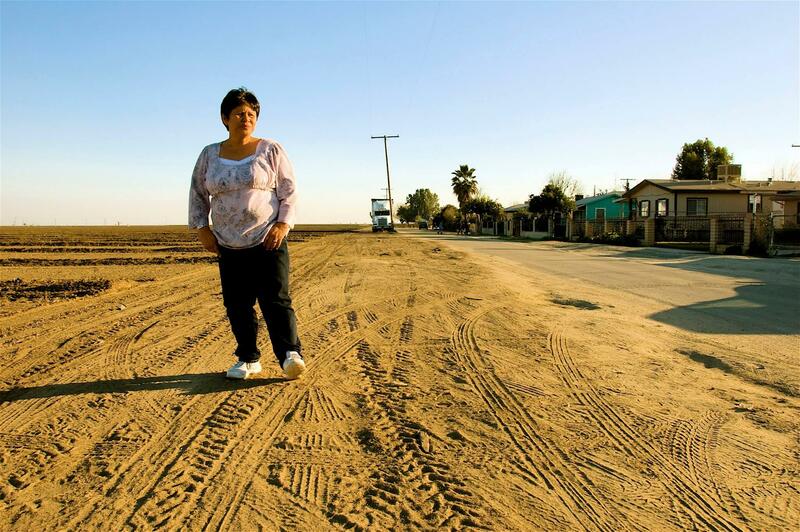 Teresa De Anda stands across her childhood home in Earlimart. This land across the street was bare for a short while after the grape fields that were there for many decades were removed to plant almond trees. De Anda had lived most of her life in her home in Earlimart, a small agricultural town north of Bakersfield. Living in a farming community, she was always concerned about the chemicals used nearby. Prior to “The Big Accident”, the caretaker and high-school graduate had no previous knowledge of pesticides. But this incident inspired De Anda to raise awareness about pesticide drift and demand change. The Central Valley native, along with various advocacy groups, played a key role in the passage of the California Pesticide Drift Exposure Act. Enacted in 2005, the act was intended to improve the state’s response to major pesticide drift incidents, by ensuring victims get appropriate medical care and attention. Gorospe recalls her mother’s passion for justice. “She saw a need for things to change and she couldn’t just sit there and not do anything,” Gorospe says. But her advocacy didn’t stop there. She became the Central Valley coordinator for Californians for Pesticide Reform, where she fought for stricter pesticide buffer zones. And also joined as director of the Committee for the Well Being of Earlimart. Teresa De Anda stands in front of her Earlimart home, feeding her pets during a KVPR interview in 2013. In March of 2012, De Anda learned she had liver cancer. After spending nearly a year in Florida, she received a liver transplant in April. But her health slowly started to deteriorate. Her family says they don’t know if the pesticides she was exposed to throughout her life contributed or caused her illness. Kevin Hamilton, the chief program officer at Clinica Sierra Vista, says De Anda was a fearless leader. Fresno Metro Ministry honored De Anda last year for her advocacy with the community group the Committee for the Well Being of Earlimart. “Teresa was a perfect example of the grassroots person, a mom, an everyday person seeing an injustice and getting involved, making a difference. And that’s why we honored her,” says Sarah Sharpe, the director of programs for Fresno Metro Ministry. Sharpe, who worked with her for many years, says De Anda’s passion for educating others has served as an inspiration to countless advocates in the Central Valley and beyond.